Cafe Campesino launched its first Birding and Coffee Tour of Guatemala in February 2014, visiting three regions in nine days, including Chajul (and its environs) in the Guatemalan Highlands where we source coffee. We logged more than 100 species of birds on the trip, visiting Antigua, near Guatemala City, Chajul, in the Quiche department, and St. Lucas Toliman, located on the southwestern shores of Lake Atitlan. We also got first-hand accounts of the 2013-2014 harvest from coffee farmer members of the Asociacion Chajulense who are desperately battling the spread of Roya. Chel, Guatemala, February 2014, by Phil Hardy. A crippling orange, powdery fungus that withers the leaves of the trees it infects, Roya, also known as coffee rust, keeps leaves from performing photosynthesis- that vital plant function that converts sunlight into energy ( learn more about Roya here). Without its necessary fuel, coffee trees are unable to produce cherries, and harvests decline. The Chajul cooperative alone expects a 50 percent drop from its 2012-2013 harvest season where it produced some 29 containers (or 1.1 million pounds) of green coffee. This is especially devastating when many of Chajul’s 1,406 members rely on sales of green coffee as a primary source of income to buy food. Helping its farmer members combat Roya is the Chajul cooperative’s greatest challenge right now. On one of the three days we were in Chajul, the cooperative distributed to its members organic fungicide mixes and seeds from trees that had successfully resisted Roya in an effort to help members clean out the fungus from existing crops and plant stronger strains of trees to start anew. But new trees take up to 3 years to produce. And many farmers live in villages where not all of their neighbors are members of the Chajul cooperative and are not as committed to combating Roya as they are. cupper at the co-op’s warehouse and beneficio in Chajul, Guatemala, February, 2014. Many farmers throughout Guatemala, in fact, have abandoned their Roya-plagued coffee trees. They have reasoned that administering multiple applications of fungicide, in addition to the regularly cleaning and maintaining their coffee trees, is not worth their time. So, in many parts of Guatemala, Roya lives-on unchecked (and presumably spreads). Government assistance to curb Roya is virtually nil for small-scale farmers, according to many of the people we talked to along the trip, who explained that much of the state-led Roya assistance efforts were tailored to large coffee farms that do not farm organically. “No hay cafe” (There is no coffee), said farmers in Chel, a village about a 2-hour drive north of Chajul. While there was some production in Chel, many of those farmers no doubt have fresh in their minds the 2011 coffee harvest when the co-op produced more than 48 containers (or 1.8 million pounds) of green coffee during one of the highest market prices in history. A high market price, combined with a high yield made 2011 a wonderful year for coffee farmers. This year is dramatically different. fungicide and new seeds to help fight Roya. February 2014. In a region that still wears the scars of harrowing human rights violations (the legal office of the Chajul co-op has helped locate mass graves in its region since the Peace Accords that ended a 36-year-long Civil War were signed in 1996), in a country that still struggles to bring war criminals to justice, it’s hard to understand how farmers can remain hopeful in the face of Roya. “There’s nothing else to do,” one farmer told us, saying that remaining hopeful and working his coffee plants was all he could do. Entities like Cooperative Coffees, who in January organized a best practice-sharing session among coffee farmers battling Roya, help bring, at the very least, solidarity and support to farmers like those in Chajul. Cooperative Coffees also initiated a Roya Relief Fund in the summer of 2013 that sends emergency monies to producer partners to help fund the costs of re-planting trees, purchasing and applying organic fertilizer, developing food security garden projects or other initiatives that may generate additional income for farmer families. Women’s Weaving Cooperative of Chajul. In an effort to get more money into the Chajul area, Cafe Campesino is purchasing hand-woven textiles from a women’s cooperative that was born out of Asociacion Chajulense and still shares office space with the coffee exporting cooperative. 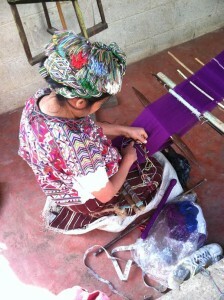 “Unidas por la Vida” (United for Life) is the motto of the Asociacion Chajulense de Mujeres (the Chajul Women’s Association), which is made up of about 50 indigenous Mayan Ixil women who weave using back-strap looms and foot-looms. They make purses, cosmetic bags, wallets, I-pad cases, pillow covers and more, and Cafe Campesino will carry some of these products beginning in the spring of 2014.
to create wallets that will soon be sold at Cafe Campesino. 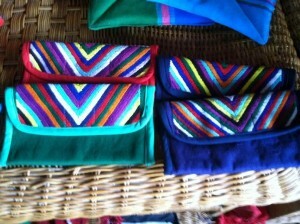 The women’s cooperative provides artisans with designs as well as prepared thread with which to work. Most women work from their homes, generating additional income while still tending to the needs of their children and families. In addition to providing jobs for women in the Chajul area, the women’s co-op also administers a micro-credit fund from which it will loan 2,400 quetzales (or about $300) to an individual woman. The loans are generally repaid within one year, can be used for whatever the loan recipient needs, and are monitored and administered at the local-level by small groups of women who make sure that the loan gets repaid. Since starting the fund in 2007, the co-op has never had a woman default on her loan, and the number of loan recipients has increased from 19 in 2007 to 800 in 2013. Look for freshly designed, newly woven (the women were working on our order while we were there in February) collection of textiles at Cafe Campesino soon!!! And if direct visits with coffee producers and artisans weren’t enough for our intrepid group of travelers, bus rides through cloud forests, chocolate tastings at Fernando’s Cafe in Antigua, sunsets on one of the most beautiful lakes in the world and sightings of more than 100 species of birds (some of which were very rare) were all on the agenda, too. The rare Northern Potoo seen in Guatemala through a telescope lens. A night hunter, it looks like a tree limb when it sleeps during the day. Our birding outings were led by our old-friend and veteran Habitat for Humanity volunteer Clive Rainey (who not long ago traded-in an Americus, Ga.-based home for Lake Atitlan, Guatemala, home). Clive took us to some beautiful, tranquil and amazing sites- lush with vegetation and active with bird-life. Among the species of birds that we saw were the White-bellied Chachalaca, the Groove-billed Ani, the Ferruginous Pygmy-Owl, the Northern Potoo, the Black Swift, the Turquoise-browed Motmot (the national bird of El Salvador, btw…), the Yellow-Throated Vireo, the Yellow-naped Parrot, the Painted Bunting, the Yellow-billed Cacique, the Azure-crowned Hummingbird and SO MANY MORE! Clive and a small contingent continued birding after the Cafe Campesino trip had ended, seeing ultimately, the Resplendent Quetzal. And so, with our first Birding and Coffee trip to Guatemala under our belts, we are poised to return with a new group! New for next year’s agenda? An overnight in Guatemala City at the Quetzalroo Hostel, where our group will hopefully get Marcos’s famed walking tour of the city. AND- iced coffee served from hand-blown martini glasses at El Injerto coffee shop in Guatemala City. Both were pre-trip highlights of this trip leader. Let us know if you want to go and email us your destination preference at travel@cafecampesino.com. and all around fantastic BIRD Guide. Thank you, Clive!